Not getting enough sleep can cause a lot of problems in our lives from a weakened immune system, not being able to think straight, having trouble remembering things, weight gain, more fine lines, wrinkles, uneven skin color, and marked looseness of the skin. Even more seriously if you do not get enough sleep you are more likely to develop heart disease, cancer, and diabetes. You are three times more likely to be involved in a car accident if you get 6 or fewer hours of sleep at night. I am guessing if you are here sleep is important to you. So let´s get right to it. According to Traditional Chinese Medicine, problems with sleep are associated with the heart meridian, which is why today´s yin yoga for sleep class will focus exclusively on our heart meridian. When the heart meridian organ is deficient not only will we experience problems with our sleep but we may also experience forgetfulness, distraction, restlessness and disturbed sleep. The heart becomes overheated and overactive when yin blood is deficient and you may experience incessant talking, disturbing dreams and disjointed thinking along with those sleep disturbances. The heart meridian needs to remain peaceful and protected. In a balanced world we would retreat into our interior world to nurture ourselves after a day of being engaged in the exterior work world. This would create harmony. Unfortunately, our contemporary commercial culture encourages us to go at one continuous, constant frenetic pace. It is the hard working, ambitious, upwardly mobile people who are admired and rewarded in our culture. When we overwork, over exercise, over engage, over party, do many things to excess, especially at this time of year, it is yang in excess and leads to burnout of yin. The result of this incessant work and activity is a restlessness that makes it difficult to sleep. When there is agitation and unrest it is difficult for the heart to respond appropriately to sensory input. This makes the heart meridian energy imbalanced and we will experience feelings of insecurity and anxiety along with difficulty sleeping. You might feel exhausted, withdrawn, melancholy of have trouble finding your words, and even short term memory loss. All of these point to an imbalance in the heart meridian that are all symptoms of those sleep disturbances. So the answer to a good night´s sleep lies in protecting that heart energy; keeping it peaceful and defending your yin energy at the end of the day. When you are finished with your work obligations for the day, remember the importance of withdrawing from the yang energy of the world and taking that time to nourish your reserves. This not only will replenish your energy reservoir for the following day, but lay the foundation for a good night’s sleep by eliminating the restlessness that can chase us to bed from the yang energy of the day. Let me know in the comments: What is your most important takeaway about sleep in this class? Getting a good night´s sleep is not something you can do in just one yoga video. 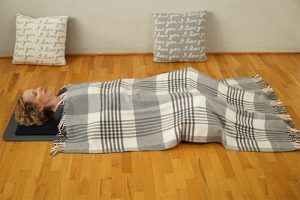 Just like brushing your teeth, yin yoga and good sleep is a way of life and is something you can embrace everyday. The best way I have learned to care embrace the yin way of life is to make good sleep a part of my everyday life. I am going to share with you a good, better and best way to do that now. Best: The best way to make yin yoga a part of your everyday life is to join our membership community. It is there that we can support you in making yoga a part of your daily life with our curated content. We have our monthly YinDulgence 90 minute LIVE workshops with 2 way videos on the last Sunday of every month at 9:30 am and 4:00 pm PT, with archives recordings made available to our members afterwards. We also have an epic series for insomnia in our membership community with yoga classes, recipes, pranayama and lectures for insomnia.